This condo has two bedrooms and two bathrooms and is located inside the beautiful Sonoran Sky Resort. The Sonoran Sky resort is the newest luxury resorts on Sandy Beach, it is the youngest in the Sonoran Resort Family in Rocky Point. The Sonoran Sky has relaxing spa experience for you, a fantastic aqua bar really close to our hammocks and right next to the heated pool (only heated during winter November thru February), a fitness center which is fully equipped, BBQ areas for the whole family with playground for the kinds and eating area for the rest of the family, 3 swimming pools and a kids pool and a convenience store. This elite condo is located on the 7th floor of the resort. 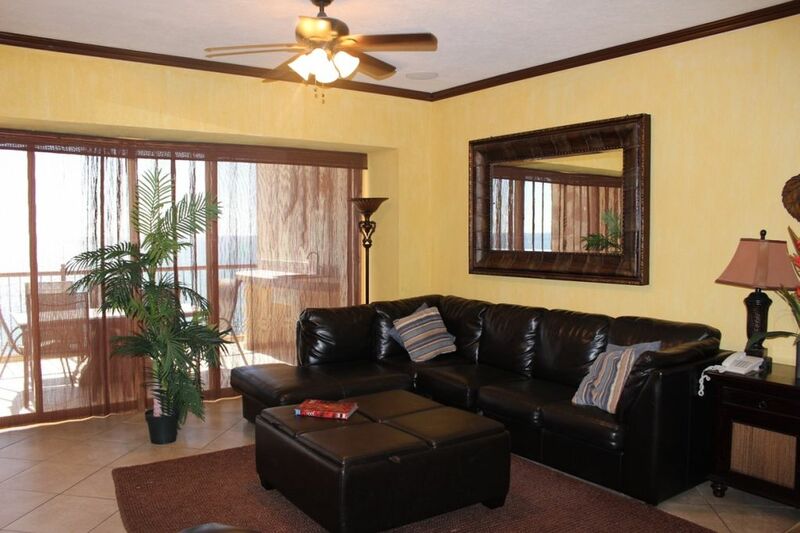 This condo can sleep two people in each bedroom and 2 on the pull out sofa sleeper in the family room. One you open the front door you will walk down a corridor hallway of pale yellow walls. The hallway walls are adorned with mirrors and beautiful pictures of art. As you reach the end of the hallway you will land in the great room where you have an L shaped black leather sectional sofa, leather ottoman, wall sized mirror and lighted end tables. When you sit on the sofa you will be right in front of the wall mounted flat screen TV. Below the TV there is a media cabinet that has the DVD, VCR and stereo system. To the left there is a small lighted niche with a floral arrangement and to the right are the glass doors that open to the terrace. The dining room has a high top table set to seat 6. The kitchen is state of the art with granite counter tops, dark wood cabinets and stainless steel appliances. You can prepare a wonderful meal in this kitchen. The only things you need are food and clothing. The kitchen has a built in wet bar with bars stools and a built in wine chiller. The master bedroom is painted sky blue and has been furnished with a cherry wood suite of furniture. The bed is fir for a king with burgundy and gold printed bedding. Across from the bed you have a TV and DVD player on top of the dresser. Many tropical plants are scattered throughout the room. The room has a large closet with full length mirrored doors. The master bathroom has a pass through to the bedroom where the Jacuzzi tub is located. The bathroom has a separate shower and a double sink vanity. The 2nd bedroom has a birch wood furniture suite which includes a queen size bed outfitted in pastel striped bedding. This room has a dresser, TV, DVD and bed side tables. The walls of the 2nd bedroom are Venetian plastered in a pale green color. The hall bathroom is also pale green with a walk in shower, commode and a single sink vanity. The terrace is furnished with a dining table, chairs and two chaise loungers. You can watch the sunrise or sunset over the Sea of Cortez. The terrace is so inviting you may even fall asleep here after a few too many cocktails. This condo has it all and will make you very comfortable! The condo has its own washer, dryer and ceiling fans throughout. You should book your vacation now! This is the perfect time of year! Love this condo, big comfy couch, great dining table inside and outside, decorated very nice, lots of dish-ware, even an easy to use lime squeezer which comes in handy for all meals and drinks! Like having the the big table outside on the patio, great sunset dinners and breakfast bloody marys had by all! Master bed is very large and comfortable. Found some kid games also, we haven't played old maid or battleship in many years! We have recommended this condo to friends and family and will stay here again!! Feels like home!